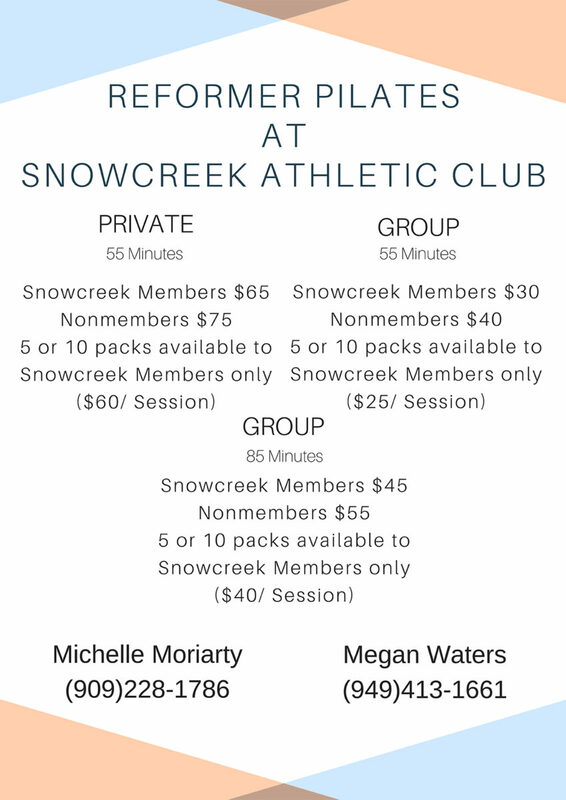 NOTE: Pilates Programming at Snowcreek Athletic Club is not part of the Snowcreek Class schedule (with the exception of seasonal mat Pilates classes). Please refer to Class & Private Session rates below & contact information for scheduling. Pilates is a body conditioning method that effectively strengthens and lengthens muscles, improves alignment, and increases flexibility while refining mind-body awareness. Developed by Joseph H. Pilates in the early 20th century as a way to improve his own health and athleticism, he established the mat work series. Later he developed and built various pieces of equipment to supplement and expand upon the floor exercises. Pilates work is appropriate for all ages and effective for anyone from the novice exercise student to the most elite athlete. It utilizes the entire body, and every exercise emphasizes the use of the core. for clients in need of special attention. Basic Reformer: Recommended for those without Pilates experience. Intermediate Reformer: Once the basics have been mastered, clients can progress their workouts to the intermediate level. Chair: A full body workout using the Pilates Chair. Private and semi-private Pilates classes available by appointment. Don’t see a time that works for you? No problem! We are flexible with times. Join now to start the most talked-about exercise program around. Snowcreek Athletic Club offers a blend of yoga classes that welcome beginners and beyond, and nourish the physical and emotional body. We strive to provide an environment in which practitioners can flourish and connect with instructor and community. Our instructors are authentically passionate for the practice, as well as each class member, have been through various intensive Yoga instructor trainings, and are trained/certified at 200+ practice hours.